Any web site must have a friendly and easy to use navigation bars. But why stop there if you can give your users a more good looking navigation experience. In "Blended Menu" you can start experiment absolutely free with any horizontal or vertical HTML menu layout without installing any program on your computer. This menu editor can be accessed any time from almost any modern browser. The Menu Generator build on principle of "WYSIWYG Editor", every change you applying to your menu will result in generated HTML CSS code. Although we gave a few layout examples you can re-customize them all as much as needed to any stylish menu you imagine absolutely free. Consider: This site is constantly updated so its recommended to Refresh (F5) the page before you start a new menu project. Overview examples how to build HTML and CSS menus. 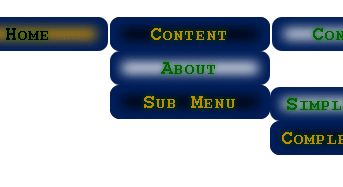 Watch videos to see how menu is created using this on line builder. Both videos demonstrating how to start from default menu layout and get finished template. Already build your menu and need to build an HTML page layout for it?! 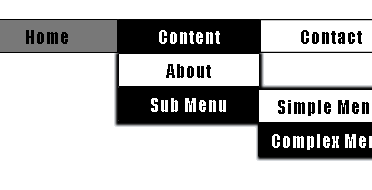 The generator uses CSS to convert a nested unordered list into a drop-down, multi-level, cascading navigation menu. All of generated CSS drop down menus are 100% CSS|CSS3 and HTML|HTML5 and designed to be more that 95% cross-browser compatible. 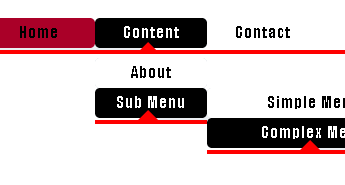 You can download the source code for all of our CSS drop down menus.